Raised Tall Bubble Windscreen Clear Made from high-quality polycarbonate. The double-bubble shape channels the flow of air over the rider, reducing the amount of air directed at the rider's torso. 25.5 mm taller than stock windscreen. 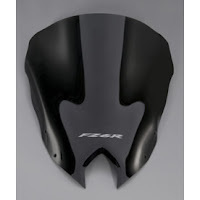 FZ6R logo silkscreened onto windscreen. Raised Short Bubble Windscreen Tinted Made from high-quality, hard coated polycarbonate. The shape channels the flow of air over the rider, reducing the amount of air directed at the rider's torso. 5 mm shorter than stock windscreen; 30 mm shorter than the Clear windscreen. 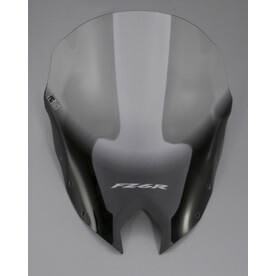 FZ6R logo silkscreened onto windscreen.